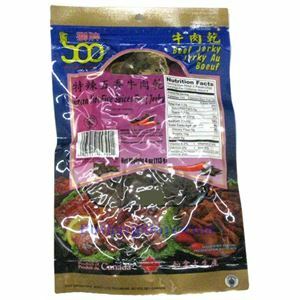 Five spiced beef jerky is an extremly popular snack widely enjoyed in China and Taiwan. This product is made in Canada, with high quality beef. Five-spice powder, one of most popularly used traditional Chinese spices, is a delicious blend of Sichuan peper, cinnamon, star anise, cloves, cumin seeds, etc, with balance of sour, sweet, bitter, spicy, salty flavors in Chinese culture. All of the five flavors - sour, sweet, bitter, spicy, salty - can be found in five-spice powder. Now you can enjoy this special delicious beef jerky any time if normal spicy is not strong enough.